View More In Motorcycle - Page 6. Note: Mitas winter tires are specially designed for winter competition in snow and ice, off-road riding only. They are not to be used on highway, bare or frozen ground as excessive wear and tread damage may occur to tire and studs. These studded winter tires are shipped with carbide tipped rally studs installed by a special pneumatic machine. Automotive studding tools will not work with these unique shaped, long studs, which are glued in position. It is a very time consuming process. These studded winter tires are high performance specialty off-road only tires and do not carry any guarantees or warranties what so ever. This tire is a Mitas / Trelleborg XT-434. This studding pattern is the PRO model - every knob dimple is studded. The size for this auction is 110/90-19 rear. It has approx. 350 studs. Motorace #20-7001 For the last decade Trelleborg MX Motorcycle tires have been produced by Mitas in the Czech Republic using molds and technology purchased from Trelleborg Sweden. 2010 was the last year of the brand name licensing agreement. The Trelleborg name use in the motorcycle tire market has now ended. 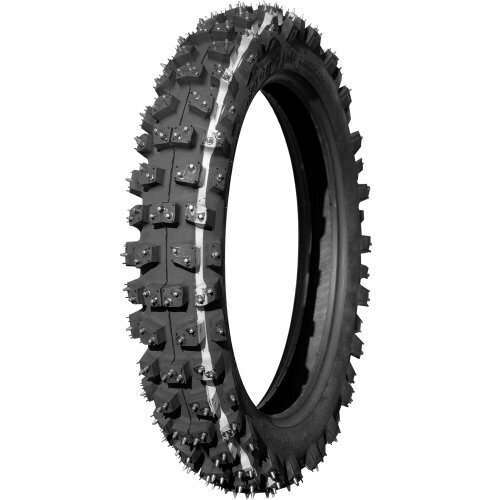 The identical MX tires continue to be manufactured by Mitas in the Czech Republic and marketed using the Mitas brand name. The original tread model numbers remain but will now be preceded by an "X" as part of the Mitas "Sport Extreme" off-road motorcycle tire product line. If you have any questions, please mail Dave at Motorace. Thanks! Imported from Europe. Ships from Massachusetts. We have been selling specialty studded tires for over 30 years. Each tire contains approximately 320 carbide tipped steel studs. These ARE NOT street legal. Off-road snow and ice use only! These tires ship with NO WARRANTY given or implied. They have a very specific use. The 110/100-18 has approx. 320 studs. If you have any questions about this product by Mitas, contact us by completing and submitting the form below. If you are looking for a specif part number, please include it with your message.